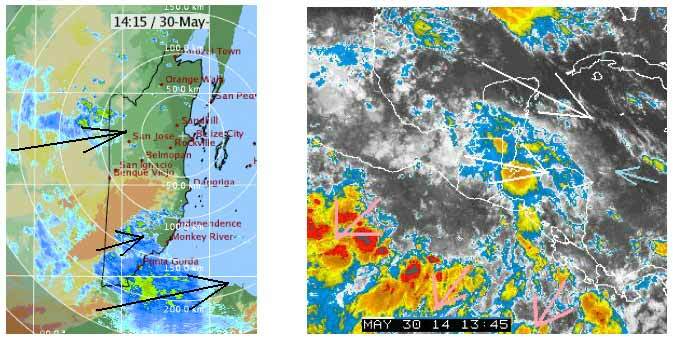 Belize NMS: Weather conditions will become a bit more moist and unstable the next couple of days. 24-hour forecast: Sunny with a few cloudy spells today and partly cloudy tonight. Sunny skies with a few cloudy spells tomorrow. Showers will be generally isolated except for a few showers and isolated thunderstorms over the south tonight and inland tomorrow. Today: Winds: E-SE 10-20 kts. ; seas: Moderate. ; waves: 4-6 ft.; isolated showers or an isolated thunderstorm. Tomorrow: Winds: E-SE 10-20 kts. ; seas: Moderate. ; waves: 4-6 ft.; some showers and a few thunderstorms. Marine Outlook: Saturday night:- Winds: E-SE 10-20 kts. With occnl higher gusts. ; seas: Mod - rough. ; waves: 4-7 ft.; small craft caution. ; some showers and a few thunderstorms mostly over the south. General Outlook: For Sat. and Sat. night is for mostly cloudy skies with some showers and a few thunderstorms over most areas, but especially along the coast. 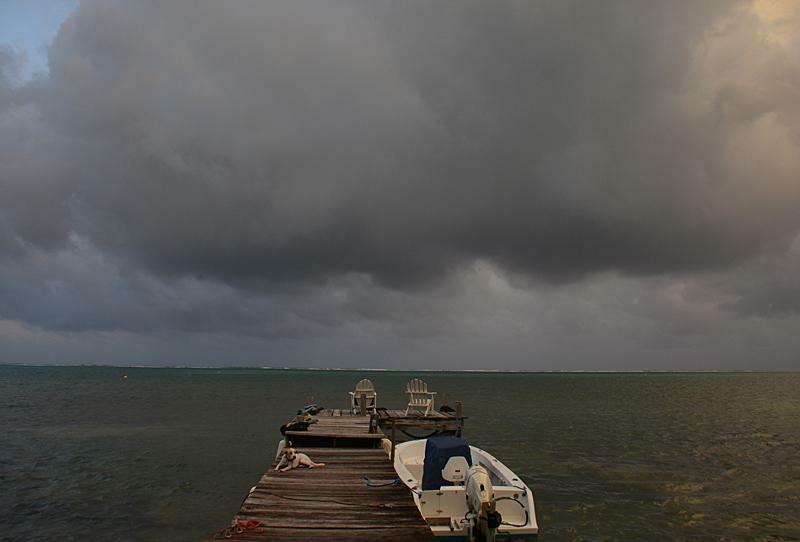 On Ambergris Caye this morning the rain begins on schedule. The mosquito awake and the cycle continues.Our expected high is 89. That rain I mentioned last night, has really developed. . . .Large areas of rain, some heavy, over Guatamala and Honduras. . . .
Just coming into western Belize and already much over Toledo and spreading up northwards into southern Stann Creek. However, there is little or nor rain behind this area shown on the below Radar picture.. . . So it looks to me, as if the Rain area will increase for a while, then die out or at least reduce later today. This rain cloud is from two sources, the spill off from that Hurricane Amanda and fairly intense ITCZ activity over Mexico/Guatamala I mentioned, last night.